Protein-protein interactions play key roles in all biological processes, motivating numerous campaigns to seek small-molecule disruptors of therapeutically relevant interactions. Two decades ago, the prospect of developing small-molecule inhibitors was thought to be perhaps impossible due to the potentially undruggable nature of the protein surfaces involved; this viewpoint was reinforced by the limited successes provided from traditional high-throughput screens. To date, however, refinement of new experimental approaches has led to a multitude of inhibitors against many different targets. 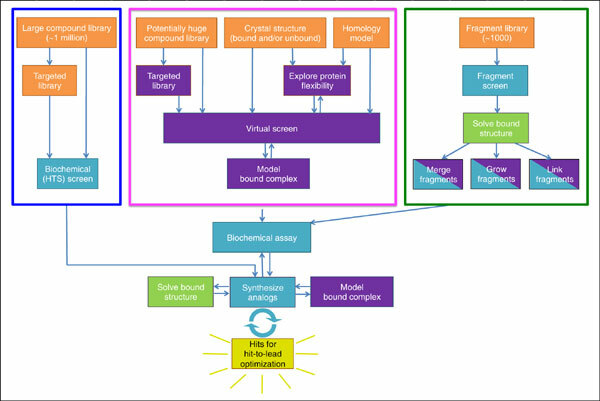 Having thus established the feasibility of attaining success in this valuable and diverse target space, attention now turns to incorporating computational techniques that might assist during various stages of drug design and optimization. Here we review cases in which computational approaches – virtual screening, docking, and ligand optimization – have contributed to discovery of new inhibitors of protein-protein interactions. We conclude by providing an outlook into the upcoming challenges and recent advances likely to shape this field moving forward. Keywords: Virtual screening, Ligand docking, Protein-protein interaction, Drug design, Protein pocket, HTS. Keywords:Virtual screening, Ligand docking, Protein-protein interaction, Drug design, Protein pocket, HTS. Abstract:Protein-protein interactions play key roles in all biological processes, motivating numerous campaigns to seek small-molecule disruptors of therapeutically relevant interactions. Two decades ago, the prospect of developing small-molecule inhibitors was thought to be perhaps impossible due to the potentially undruggable nature of the protein surfaces involved; this viewpoint was reinforced by the limited successes provided from traditional high-throughput screens. To date, however, refinement of new experimental approaches has led to a multitude of inhibitors against many different targets. Having thus established the feasibility of attaining success in this valuable and diverse target space, attention now turns to incorporating computational techniques that might assist during various stages of drug design and optimization. Here we review cases in which computational approaches – virtual screening, docking, and ligand optimization – have contributed to discovery of new inhibitors of protein-protein interactions. We conclude by providing an outlook into the upcoming challenges and recent advances likely to shape this field moving forward.